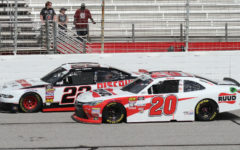 NASCAR Xfinity drivers compete in last year’s Rinnai 250 at Atlanta Motor Speedway. The three top NASCAR series return to Atlanta this weekend after action-packed season openers at Daytona. 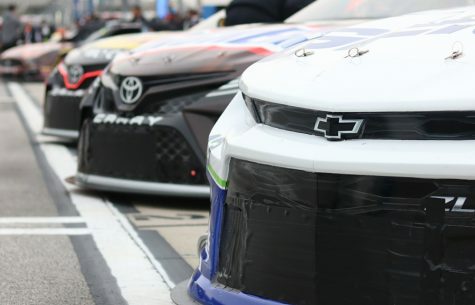 New body styles, aero packages, and engine configurations pose many unknowns to the weekend’s events as teams familiarize themselves with many unknowns to begin the 2019 season. NASCAR’s opening weekend at Daytona gave fans quite a show with two first-time winners shocking both the Xfinity Series and Gander Outdoor Truck Series. The Monster Energy Cup Series capped the triple-header weekend with a meaningful tribute as Joe Gibbs Racing honored a valued member of the racing community in a heartfelt, meant-to-be win. 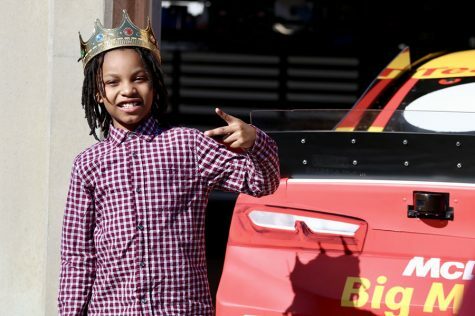 Before the haulers parade through downtown Hampton Thursday night ahead of a weekend schedule filled with activities on and off the track, here is a recap of last weekend’s action at Daytona. The NASCAR Gander Outdoors Truck Series kicked off the excitement at Daytona with the NextEra Energy 250. After charging to the lead in the final stage, Georgia born driver Austin Hill, operator of the No. 16 CHIBA Toyopet Toyota for Hattori Racing Enterprises, was able to stay up front, avoid wreckage, and win the first race of his career. This is Hill’s first season driving for Hattori Racing Enterprises and so far it looks as if he has transitioned quite smoothly. Last season, the team raced the No. 16 truck to win the series championship then piloted by Brett Moffitt, current driver of the No. 24 Plan B Sales Chevrolet for GMS Racing. This is a major opportunity for Hill to prove his driving abilities as he came from a smaller, less competitive race team last season. The first stage of the race played out almost incident free with Sheldon Creed, driver of the No.2 United Rentals/A.M Ortega Chevrolet for GMS Racing dominating after stealing the lead from pole winner Christian Eckes, operator of the No.51 SiriusXM Toyota for Kyle Busch Motorsports, on the second lap. The only caution came when the No. 54 N29 Technologies Toyota caught fire with Natalie Decker behind the wheel for her first truck series start at Daytona with David Gilliland Racing. The second stage stayed relatively calm for a race at Daytona with just a three-car pileup drawing a caution. Father and son, David Gilliland, driver of the No. 17 Fred’s/Valvoline Toyota for David Gilliland Racing, and Todd Gilliland, operator of the No. 4 JBL Toyota for Kyle Busch Motorsports, battled for the lead along with 2016 truck series champion and pilot of the No.13 Tenda Heal Ford for ThorSport Racing, Johnny Sauter. Angela Ruch, driver of the No. 8 JJ Resources Chevrolet for NEMCO Motorsports, took the lead early in the final stage of the race just before “the big one” struck. Ruch ended up finishing 8th marking the second-best finish for a female driver in the truck series to date. Just several laps into the stage, Creed made contact with Jordan Anderson, driver of the No. 3 Bommerito.com/FVP Parts Chevrolet for Jordan Anderson Racing. Anderson spun into the wall as Creed spun in the opposite direction taking out ten trucks behind them. Most notably involved were prior leaders Sauter and Todd Gilliland. From that crash on the chaos at Daytona didn’t stop. A single car incident drew the next caution just before Kyle Busch Motorsports teammates Todd Gilliland and Harrison Burton, driver of the No. 18 Safelite Auto Glass Toyota, got into each other as the level of aggression continued to rise. Another two-car accident plagued the race before “the big one” struck yet again involving another ten cars. Gus Dean, the pilot of the No. 12 LG Air Conditioning Technologies Chevrolet for Young’s Motorsports, set of the major wreck when he got loose and turned the No. 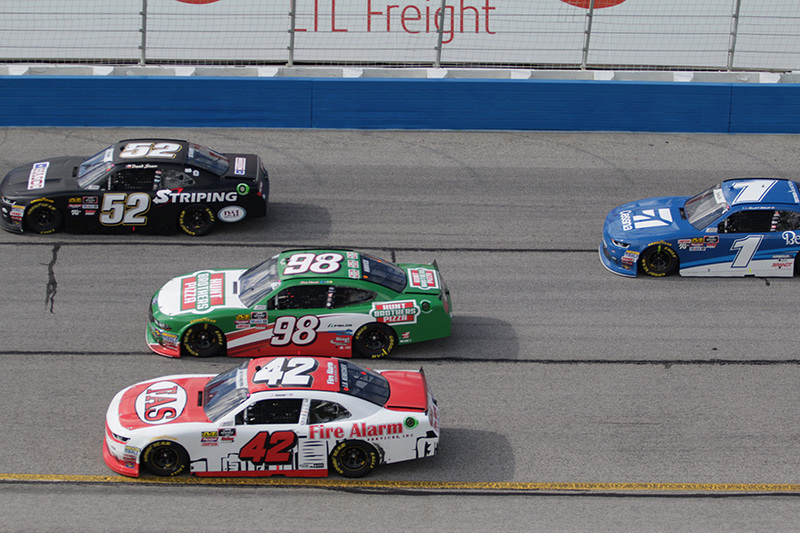 99 Carolina Nut Co./Menards ThorSport Racing Ford of Ben Rhodes into the rest of the field packed closely behind them. The incident notably ended the night for Creed as his truck went up in flames. With the end near, three cars were collected in a collision taking the event to overtime. Hill maintained the lead in the final laps taking the win with just nine trucks behind him that survived the wreckage. The race broke the record for most cautions at Daytona in a truck series event with a whopping 11 yellow flags flown. Nearly half of the 111-lap race was run under caution. Looking forward to Atlanta, drivers will get to test the power of their trucks on a mile and half track for the first time this season. If last year’s race winner and series champion Moffitt looks to repeat his victory this season he’ll have to do it with a new team and all-new equipment giving the real advantage to Hill who’ll be piloting Moffitt’s old ride. Although Hill may not have the experience of Moffitt, he’ll have the help of his championship worthy team behind him and confidence off a fresh victory at Daytona. Sauter, a usual threat at mile and half tracks, will be one to watch after finishing third at Atlanta last season as well as in 2017 and having a successful start to Daytona before being swept up in crashes. Rhodes similarly had a decent run at Daytona before being involved in an incident and is definitely a serious contender to watch this weekend after a top-5 finish last season as well as in 2017. After scoring a second place finish at Daytona, Grant Enfinger, driver of the No. 98 Champion Power Equipment Ford for ThorSport Racing, likely hopes to keep the momentum up going into Atlanta. With top-ten finishes at the track the last three years and current success, don’t be surprised to see Enfinger running up front in the Atlanta 200. As the chaos of the NextEra Energy 250 came to an end, the NASCAR Xfinity drivers hit the track the next day at Daytona for the NASCAR Racing Experience 300. It may not have been nearly as hectic as the previous night’s race, but the event was just as surprising. Although it wasn’t until the final stage, Michael Annett, pilot of the No. 1 American Heart Association/Flying J Chevrolet for JR Motorsports, showed dominance over the field and claimed the first win of his career in the Xfinity Series. To start the race, Jeffery Earnhardt, grandson of legendary driver Dale Earnhardt and operator of the No. 18 iK9 Toyota for Joe Gibbs Racing, controlled the first stage leading nearly every lap of it from the pole position. This was Earnhardt’s first start with Joe Gibbs Racing as he looks to take advantage of driving for the dominant organization after years of competing with much smaller teams. Stage two went by incident-free as well although the lead shifted between several different drivers. Ross Chastain, pilot of the No. 10 Nutrien Ag Solutions Chevrolet Kaulig Racing, led 22 laps of the stage, the most of any driver during the stage. As the final stage began, the lead switched between Atlanta native Brandon Jones, driver of the No. 19 Juniper Networks Toyota for Joe Gibbs Racing, and Tyler Reddick, operator of the No. 2 Pinnacle Financial Partners Chevrolet for Richard Childress Racing. As neither driver could secure the lead, Annett took the top-spot leading the final 45 laps of the race. Annett’s win wasn’t exactly smooth sailing though. On lap 80, a wreck involving Earnhardt and Ray Black Jr, driver of the No. 07 Isokern Fireplaces & Chimneys/Scuba Life for SS-Greenlight Racing, drew a caution. Annett found himself fending off Jones and his JR Motorsports teammate Justin Allgaier, driver of the No. 7 Brandt Chevrolet, for the lead and ultimately the win. 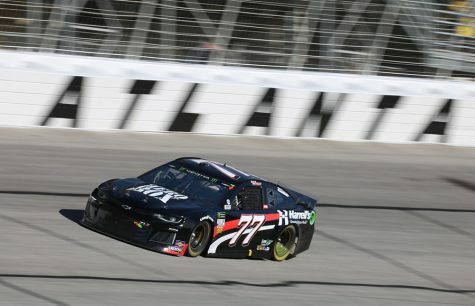 Although Annett hasn’t had a lot of success at Atlanta in the past couple of years, his confidence and strong start going into the season should help to improve his results. Xfinity drivers haven’t been able claim victories at Atlanta at all because for over the past decade, Cup series regulars have controlled and won the race. However, this season with no big-name Cup drivers entered to compete, the race will be left to Xfinity regulars. Coming off a runner-up finish at Daytona and scoring a top-ten at Atlanta last season, Allgaier seems to have a better shot at a win this weekend than most of the current Xfinity drivers. With a fifth place finish at Daytona, Austin Cindric, driver of the No. 22 MoneyLion Ford for Team Penske, should expect to have just as well of a run at Atlanta. Cindric placed in the top-ten at Atlanta last season which was one of the highest spots possessed by an Xfinity regular. Finishing right behind Cindric in the NextEra Energy 250 was Christopher Bell, operator the the No. 20 Rheem Toyota for Joe Gibbs Racing. Bell also brags a top finish at Atlanta placing third here last year. Bell has just as good of odds as Cindric and Allgaier to dominate at the track. Rounding out the weekend at Daytona, the Monster Energy Series Cup drivers made their season debut in front of a sold-out crowd and gave them a more eventful race than they may have even anticipated. Denny Hamlin, driver of the No. 11 FedEx Toyota for Joe Gibbs Racing, took the win paying an emotional tribute to J.D. 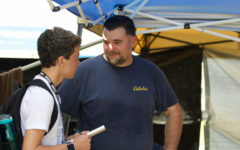 Gibbs, former racer, president and co-founder of Joe Gibbs Racing and son of team owner Joe Gibbs. The NASCAR community lost J.D. last month after he passed away following a long battle with a neurological disease. The win was especially meaningful due to the fact No. 11 was also J.D.’s racing number. To start the race, young gun William Byron, driver of the No. 24 Axalta Chevrolet for Hendrick Motorsports led from the pole position with Hendrick Motorsports teammate, Alex Bowman, operator of the No. 88 Nationwide Chevrolet by his side. The two made up the youngest first row of the race in Daytona 500 history, but their time up front was short lived. Matt Dibenedetto, driver of the No. 95 Procore Toyota for Leavine Family Racing, dominated the first half of stage one with his new race team before chaos broke loose. Fighting for the lead, Ricky Stenhouse Jr., driver of the No. 17 Fastenal/3m Ford for Roush Fenway Racing, made slight contact with the No. 1 Monster Energy Chevrolet piloted by Kurt Busch for Chip Ganassi Racing. Kurt Busch spun into the rest of the field collecting four other cars including last year’s Daytona 500 runner up, Bubba Wallace, operator of the No. 43 Aftershokz Chevrolet for Richard Petty Motorsports. 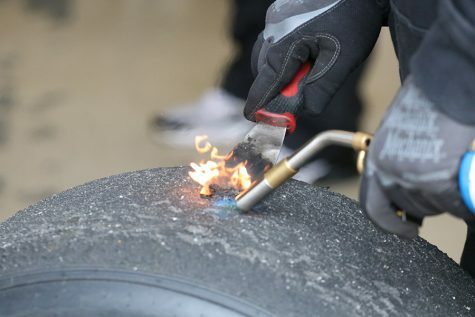 This was not the start to the season Kurt Busch was looking for in his new ride with Chip Ganassi Racing. After the incident, the lead shifted between Stenhouse Jr. and Kyle Busch, driver of the No. 18 M&M’s Chocolate Bar Toyota for Joe Gibbs Racing. Busch ultimately prevailed to win stage one. As stage two tarted, last season’s MENCS champion, Joey Logano, operator of the No. 22 Shell/Pennzoil Ford for Team Penske, took over the top position. Kyle Busch and Dibenedetto returned to the front to each take control of the lead before a small two-car crash in the back of the field. Following the accident, Ryan Blaney, driver of the No. 12 Menards/Peak Ford for Team Penske, claimed the lead and went on to win stage two of the race. To begin the final stage, Byron charged back to the led for the first time since lap two. Byron went on to lead the most consecutive laps of the race by staying out front for 42 before tumult broke out on pit road. As a group of cars attempted to slow from 200 mph to the 60 mph pit road speed, B.J. Mcleod, driver of the No. 51 Jacob Companies Chevrolet for Rick Ware Racing tried to duck back on to the track but made contact with his teammate, Cody Ware, the pilot of the No. 52 Winn Dixie Chevrolet, causing both cars to uncontrollable spin through the grass and down pit road. 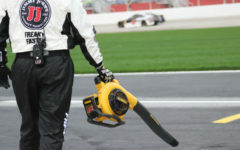 The teammates ended up rear-ending three cars that were in the process of pitting, including seven-time Cup champion Jimmie Johnson, driver of the No. 48 Ally Chevrolet for Hendrick Motorsports. This was both Ware’s and Mcleod’s first Daytona 500 start. Toward the end of the final stage, Hamlin drove to the top position which he would have to compete for with his teammate Kyle Busch as the end of the race drew near. But, the chaos was nowhere near over with. Before “the big one” struck, two single car spins drew cautions when both of the drivers blew right rear tires. When the green flag flew again, the drivers weren’t able to complete a single lap before another massive wreck. This time Stenhouse Jr. got into the back of the No. 42 Chip Ganassi Racing Credit One Bank Chevrolet of Kyle Larson damaging five cars behind him including Bowman and his Hendrick Motorsports teammate, Chase Elliott, the pilot of the No. 9 Napa Chevrolet. Again, as soon as the wreckage was cleared and the green flag dropped, another major collision occurred. Despite the damage, aggressive driving continued as Michael McDowell, operator of the No. 34 Love’s Travel Stops Ford for Front Row Motorsports, made contact with Clint Bowyer, driver of the No. 14 Rush Truck Centers/Mobil 1 Ford for Stewart-Haas Racing. Bowyer spun into the wall taking Hendrick Motorsports teammates Byron and Elliott along for the ride. In total, eight cars were involved in the wreck. As the race entered overtime, Hamlin led a clean restart and drove to victory holding off both Logano and Kyle Busch. Joe Gibbs Racing drivers finished in the top three spots as they saluted the late J.D. Gibbs. Although Hamlin’s team is confident going into Atlanta, the race poses massive unknowns. This will be the first race the drivers will run an all-new aero package as well as a new engine configuration. The intention of the change is to create closer more competitive racing at mile-and-a-half tracks like Atlanta, but how the cars will actually perform is uncertain. In addition to these changes, the Fords debuted a new Mustang body style at Daytona. Although this change has little effect at a restrictor plate tracks like Daytona, it could have a much larger impact at a mile-and-a-half track like Atlanta. Until the race teams have had time to figure out how to optimize all the new configurations it’s likely not all of the cars will be able to perform at their best and practice at Atlanta will come down to a lot of trial and error. Despite the implications the adjustments will pose, it’s likely last year’s race winner, Kevin Harvick, driver of the No. 4 Busch Beer Ford for Stewart-Haas Racing, will still be able to find success at Atlanta. Harvick has completely dominated the track across the NASCAR series for the majority of his career. 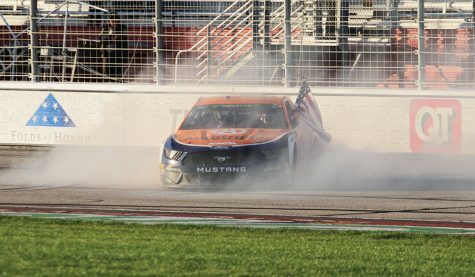 Adapting to the Mustang body style will probably be a challenge, but Harvick’s experience at Atlanta should help outweigh it. Although he too will be wheeling a Ford, Brad Keselowski, driver of the No. 2 Discount Tire Ford for Team Penske, should also be able to have a good run at Atlanta. Keselowski had a runner-up finish in last season’s race and additionally won the race in 2017. Elliott has had promising finishes the past two years at Atlanta landing in the top-ten and top-five. Driving a Chevrolet, he should have more familiarity with his car than the Ford drivers even with NASCAR’s regulation changes. Channeling the momentum he gained late last season, Elliott should be able to pull together another solid finish if not a win at his home track. The final two drivers that stand out going into Atlanta would be the Busch brothers. Both Kyle and Kurt Busch have won and dominated at Atlanta in the past and are likely to find prosperity at the track yet again. Kyle Busch holds the slight advantage over his brother due to the achievement his race team is coming off of following Daytona. Kurt Busch additionally has to adapt to working with his new team at Chip Ganassi Racing, although he seemed to be running well at Daytona before being swept up in a wreck. The large amount of unfamiliarity that drivers and teams possess going into Atlanta should provide for an exciting and unexpected races across the series, but especially for the MENCS finale. Fans wishing to to take part in race weekend festivities can purchase tickets on the track’s website or by calling 877-9-AMS-TIX.